Last night, I finished the last of my round robin blocks for the year! This one was for Connie E in the Mini DYB Round Robin. Her lovely little blocks were just 2 ½"x3 ½"! She plans to make a little book out of them and the inspiration photos were lovely, so I can't wait to see these come together! Connie asked for the stitching to be white/cream/ecru with one other color used sparingly for accent and provided a number of color swatches for inspiration. I was so glad to see that green was still available! It's not often that I get to work my favorite color scheme in a round robin! I love how the block turned out and hope that Connie likes it too! 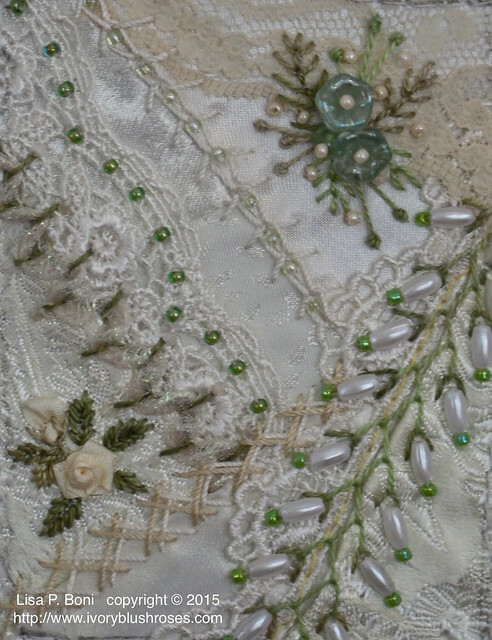 I've actually been considering a project like this using white fabrics and lace with green stitching for some time. I love how this turned out, so think I may have to bump that project up on the list! If only there were more hours in a day and more days in a week that were available to stitch on all the projects I want to do! Also in the last week or so, I finished the last of the Steam Punk Round Robin blocks. This one for Wilma in the Netherlands! 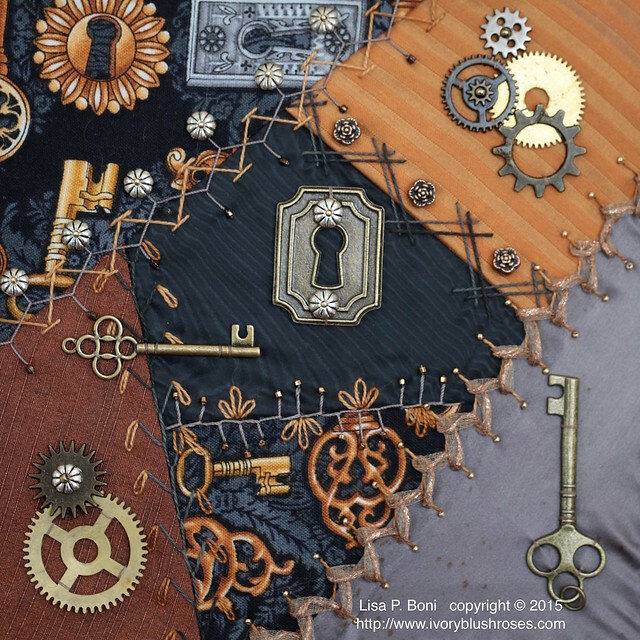 I loved the key fabric she based her blocks around and so had to add a couple of keys and a escutcheon plate. She asked for stitching to be done in the colors on the blocks. It turned out well and I hope she's happy with it! It has been a long time since I did any smocking, but a favorite co-worker of mine was having a baby girl and I got inspired to make her a tiny bonnet! 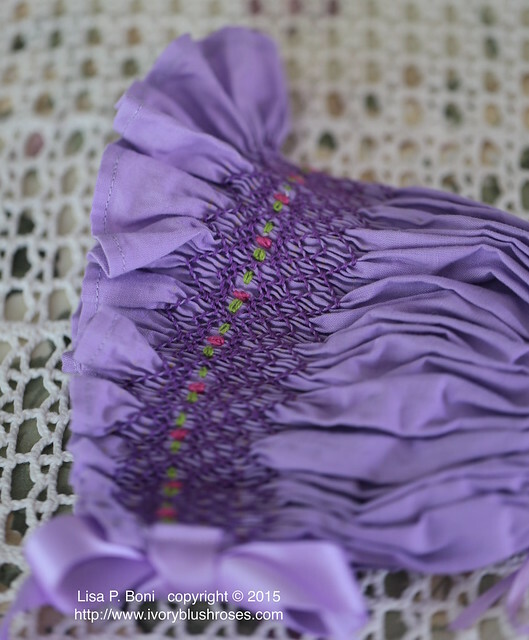 When my daughter was little, I made many smocked dresses for her and for my niece along with smocked bonnets for all the baby girls I knew, so it was great fun to revisit the art! I've also been having fun birding! On the morning after my last work shift each week, I've been stopping various places to bird watch. My current favorite spot is a marshy area south of a reservoir near LaSalle, Colorado. There I've been able to see many species of birds that I've never seen before, such as White Faced Ibis, Whimbrels and more. The weather hasn't been conducive to good photos, but I did manage to get this shot of a Great Tailed Grackle sitting on a fence post. The grey sky sure provided a backdrop that allowed him to show to greatest advantage! Such a funny face they have when looking straight on! 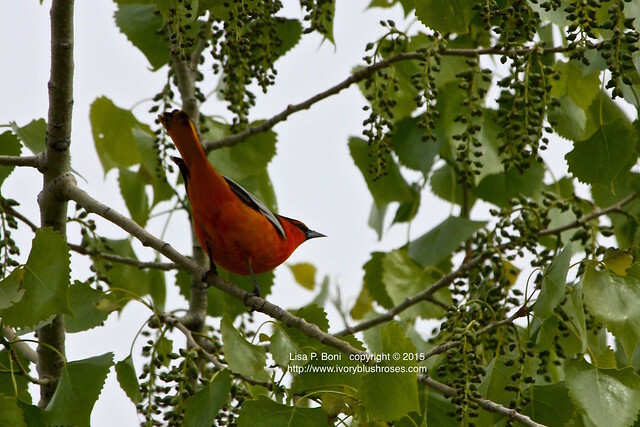 Another morning, I stopped by the Rocky Mountain Arsenal Wildlife Refuge again, specifically to see if the orioles had arrived! I'd seen the nests hanging from the trees all winter long. I was rewarded with several views of them! Such brilliant and beautiful birds! They like to stay high in the trees though, so all the photos I was able to take were from below. At home the bird feeders have been filled to the brim with birds (and squirrels!) and a new visitor to my yard! The first time I saw this beauty of a bird, I couldn't believe it! It's a Lazuli Bunting and though I've seen them in the bird book, I'd never seen one in life before! Both he and his wife have been visiting for days now and I suspect they have a nest nearby. Such a joy to have them! 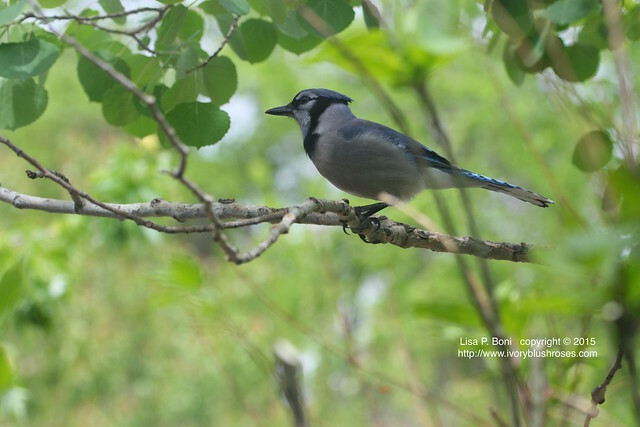 The other spot of blue coming to the feeders is this Eastern Blue Jay! Lovely birds, if a bit of a bully with the other birds. 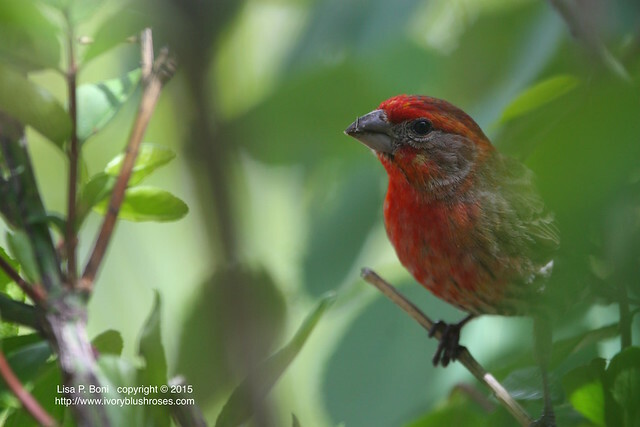 The color continues with the brilliant reds and oranges of the House Finches! 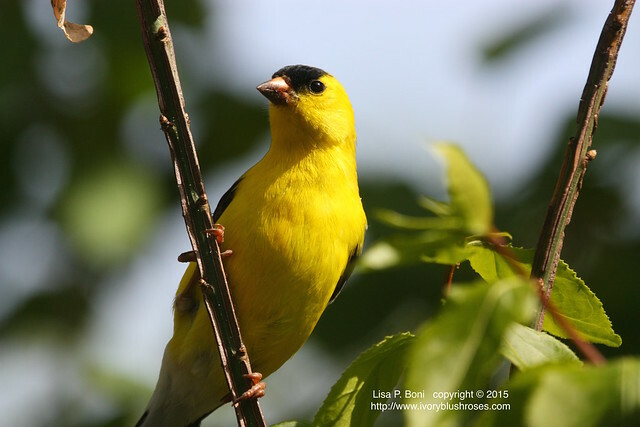 There are a few American Goldfinches as well! Love to see them as they aren't terribly common birds in our area! Then there is the Red Breasted Nuthatch that comes in to grab his seed and go. Such busy little birds! 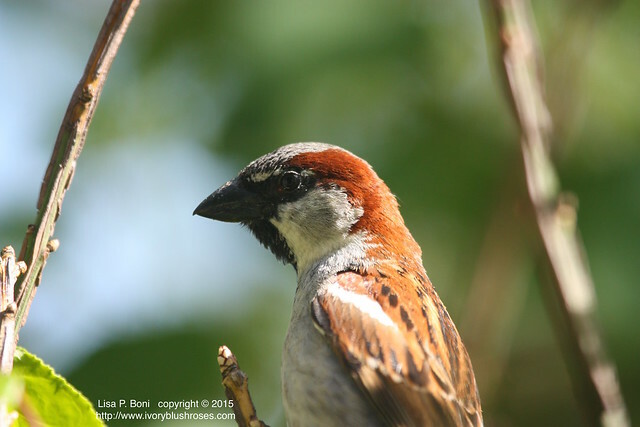 There are House Sparrows that nest in the birdhouse on the patio. They are already on their second brood of the year! Last year I think they raised at least three or four nest-fulls! 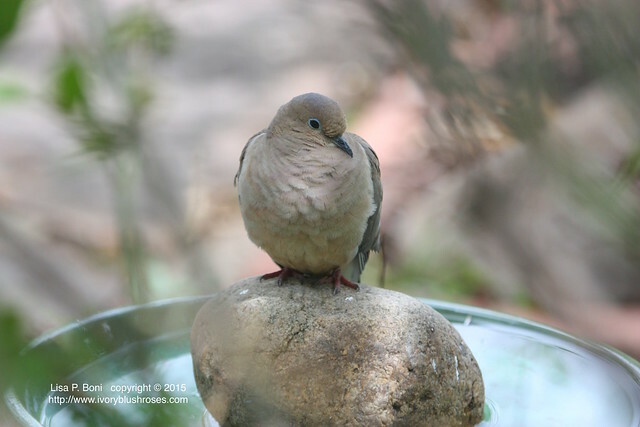 Usually I have a pair of Eurasion Collared Doves that hangs around all day. Lately, they've been joined by a pair of Mourning Doves! 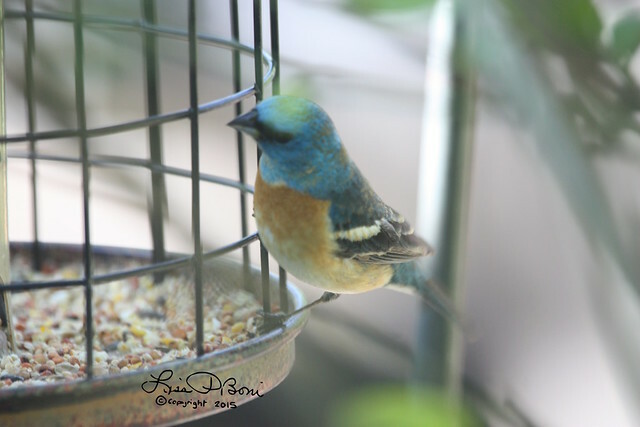 I still can't get over the Lazuli Buntings! Such a treat to have them, along with all of the other lovely birds that come to visit! All the twittering and activity at the feeders just makes my heart sing! It is such a pleasure visiting you Blog as there are always such pretty treasures to see. From the CQ to the smocking and also the gorgeous birds! WOW! Bonnets and Buntings, Oh My!! Could you please please send the lazuli buntings my way? How wonderful to see them. Your pictures are absolutely beautiful. 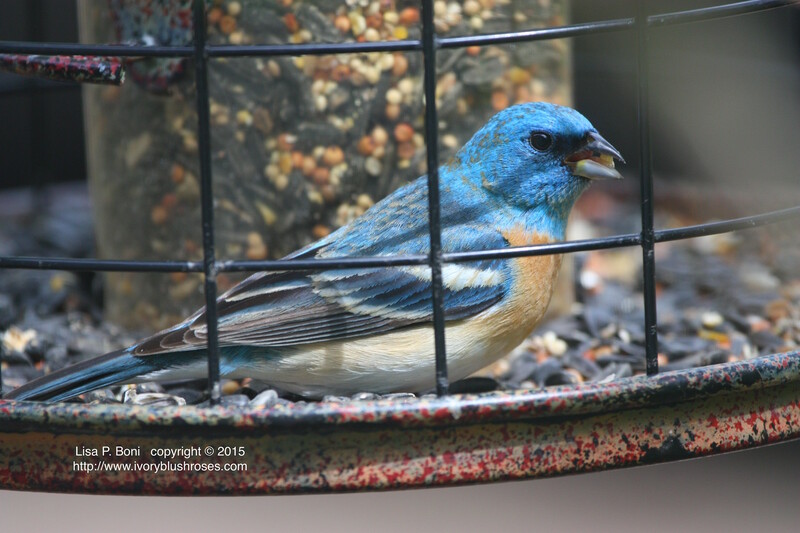 I had an indigo bunting on the feeder the other day but I have no good way to take pictures since it's through a screen. I forgot the beauty of your block when you ended with birds. 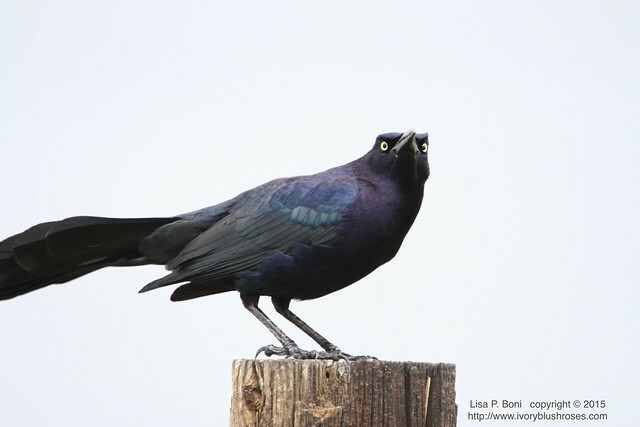 The tail on the grackle was something. I'm not a fan of house sparrows. 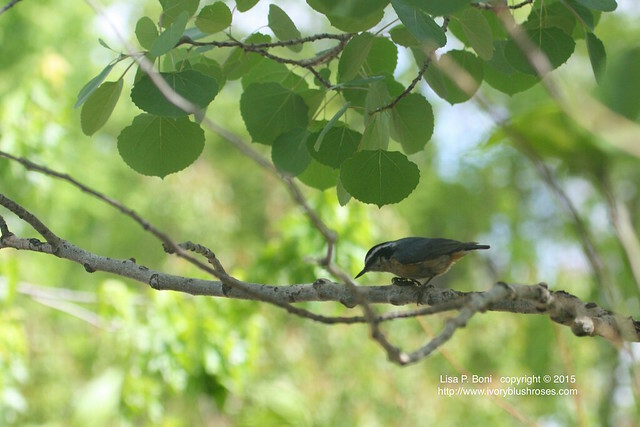 They are not indigenous birds and compete with the Eastern bluebird for cavity nesting spaces. They tend to nest 5 times per season and the bluebirds only 3. I've seen them peck the mother blue bird to death while she sits on her eggs just to take over the nest site. They are so prolific that I will continuously remove their nests in order to give the other guys a fighting chance. We have a whole nest box monitoring program in Maryland where we routinely remove house sparrow nests and we have seen a rise in the number of bluebirds as a result. Love the block Lisa! I can't wait to put my book together after seeing the beautiful work you four ladies have done on them! Thank you! White and green made a beautiful block. The birds are amazing!! I've never seen most of the birds you have photographed. Lucky you! I can't decide which is more beautiful, your stitching or your bird photos....I think it must be that you just see beauty everywhere, and express it in everything you do. As always, I love your stitching that tiny block is exquisite. The bonnet is really sweet. What great shots of the wonderful, colorful birds. I love that CQ block and the photos of the birds are amazing. I'm a stitcher and bird watcher also. Thank you for this enjoyable post. Ditto to everything already said. Your stitching and pics are wonderful! !